Great tale Gwyn, I had two new kittens in a wicker basket on the back of motorcycle, my partner was riding pillion. I looked in my mirror (whilst travelling down the centre of the Old Kent Road at 30mph 😉 and looked in my mirror, upon my pillion’s waxed cotton shoulder was a three week old black kitten, with the wind blowing through her hair, ears back, the only thing missing were goggles. The fearless feline had climbed out of a air hole in the side of the basket, which was over the road, and some how climbed up my passenger’s back…. Houdini, as she was named, lived to the ripe old age of 18, the other kitten, a rare female ginger was still safe in the basket. You were VERY lucky Peta! What a great story, and I love a happy ending. 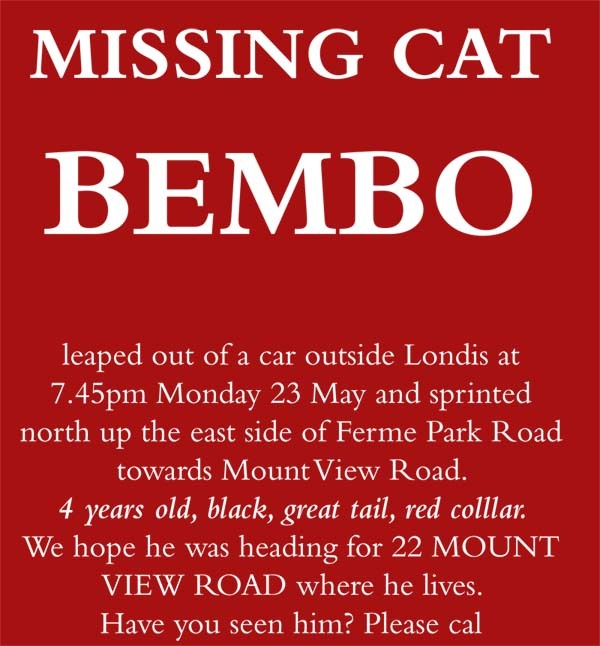 I know how I would feel if our cat went missing. My old cat lived to be 23 years old, I don’t expect that kind of life span for this one. I will enjoy his company for as long as I can.